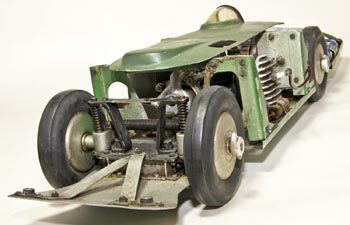 This lovely model of EX 135, Goldie Gardner's record breaking MG, shows that there are still some surprising pieces of history waiting to be discovered. 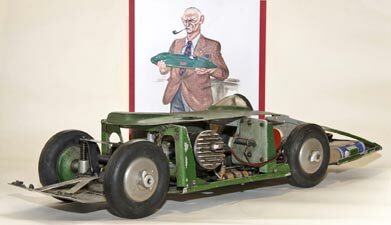 Several static models of this car were made in the late 1940s, but as far as was known, only two true tethered racing versions. 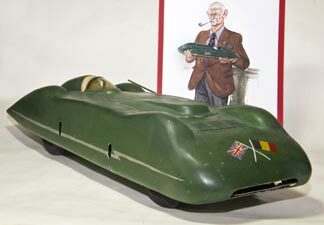 Lucy Gascoigne's 5cc version described previously, and a larger 1/8th scale model built by Ian Moore in 1948. Moore's car used a Gerald Smith Lapwing motor, again mounted horizontally, but this time driving the rear axle through spur gears. Unlike the Gascoigne car, the body was fabricated from wood with much of the material being Cedar from cigar boxes. The car illustrated was purchased at Sandown Park early in 2009, and is much more sophisticated than either of the other versions, both in the design and engineering. At the moment its origins remain a mystery, but it is such a significant find that OTW is more than happy to publish details, and photos, kindly provided by Geoff Holden. The observations and deductions are just that and both Geoff and OTW would welcome any further information that anyone could shed on this very rare car. The chassis does not follow any of the published plans for this car, being entirely fabricated from formed sheet aluminium, riveted together. Along with the exquisitely made, hand beaten body, this would indicate someone that was quite at home with the forming and fabrication of aluminium and the construction methods used. The overall size of the car at 22¾" gives a scale of around 1/8th which is the same as the Moore car and correct for the ZN semi pneumatic racing tyres and wheels that have been used. Unlike the other two examples, this car has working suspension on both front and rear axles, which was comparatively rare by the time the car was built. 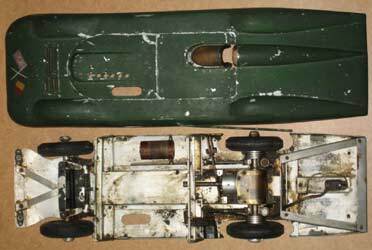 There are clues to when this might have been as the front suspension and steering is taken from the rear of an E&M Maserati which was not produced until 1947. 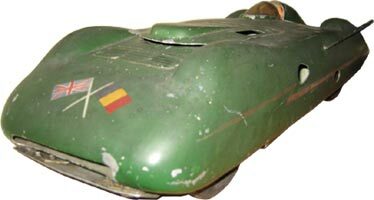 The Belgian flag would also indicate that it was built after the car was taken to that country for record attempts. 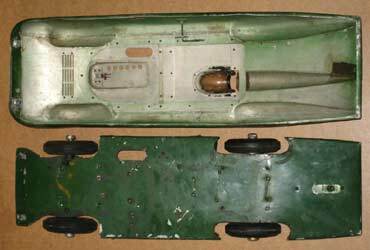 The layout of the car would indicate that a spark ignition motor of possibly 6-10cc was fitted horizontally. The ignition coil would support it being a spark engine and there is a slot in the chassis plate for the exhaust to come out of the bottom of the car. 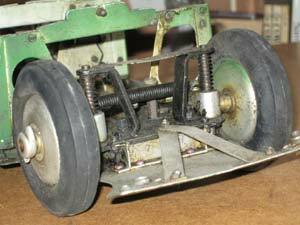 What is not clear is how the motor might have been mounted as any brackets or fittings associated with this aspect of the design are missing. The front suspension is via sliding blocks, which also turn to allow a degree of steering. The entire rear axle and gearbox assembly is also sprung, with radius arms locating it. 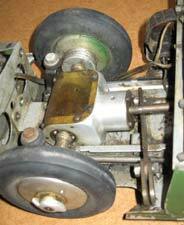 What is slightly puzzling is the complicated steering arrangement with adjustable track rods and a slotted adjuster. This is far more sophisticated than would be normal on a tethered car as most had no or very basic steering. The arrangement for tethering is also a bit of a mystery at present as one bracket is quite obvious, but it does not seem likely that it was in this position. No front bracket is evident from the photographs. On the left hand side of the body is a pivoted 'knock off' arm which acts on a Bat type fuel cut off valve. Other features are a switch, presumably for ignition under the tail and a socket, that was probably for a booster battery for starting. 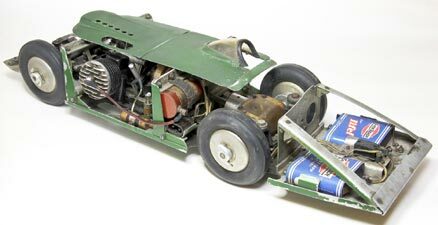 Again slightly unusual was the use of a fuel cut off rather than ignition which was the norm, unless the engine was converted or replaced by a glo version at some stage. 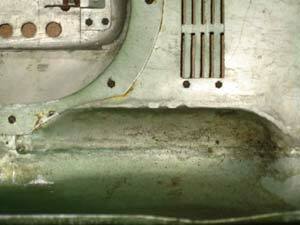 The body is a superb piece of craftsmanship by any standards and completes what is a most rare and fascinating car. Geoff has very kindly provided the following photos of the car in its completed state. It is not a restoration in the true sense of the word as Geoff has resisted any temptation to change, alter or refinish anything that was there when he obtained the car. He has also sourced period items and components to accompany the Gerald Smith Lapwing that he managed to locate. The result is a superb example of an iconic car, posed in front of an illustration of Lt Col 'Goldie' Gardner also with a model of EX 135. Congratulations to Geoff on finding and then rebuilding this important car so sympathetically. The car has been displayed at a number of events, including the Heritage Motor Centre at Gaydon, where it was seen alongside the full sized original. Thanks to Geoff Holden for photo's and information.